Is there sufficient space there for me to solder one of the UFL connectors available at ebay , or am I better off soldering a coax cable here, and is the signal the center pad? @Ken-Conrad so are you saying you can increase the range of the AP by adding antenna if so this is a must have. Also a case could be made a directional antenna would be possible, right? 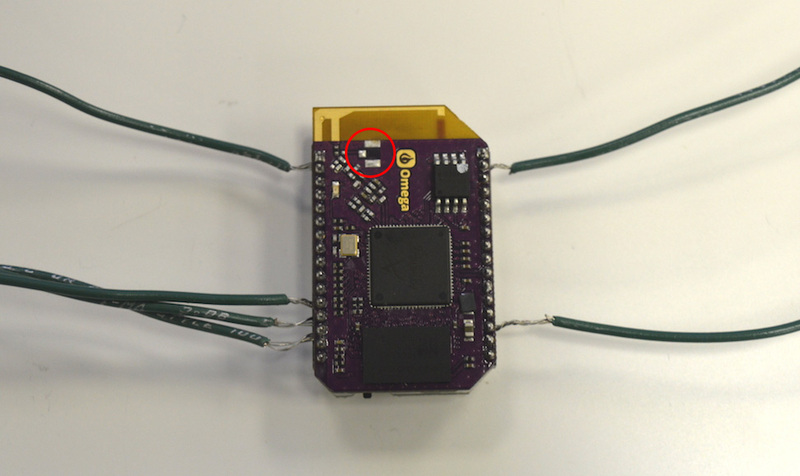 However, we have done some tests and external antenna has the exact same range as the antenna on the PCB. u.FL connector is mainly used if you wish to enclose the Omega in an all-metal enclosure, but still want to allow Wifi signal to pass through. I am surprised that you didn't achieve better range with an external antenna, perhaps you tried with a low gain antenna .... this should work with a higher gain antenna. The circuit board antennas are amazing for what they are. An external antenna with greater dB works for me to extend the broadcast range, provided the board provides sufficient rf power, the on-board antenna is disconnected and the new antenna is impedance matched. Yes Rudy, in my experience a directional antenna can significantly increase the range of Wifi. Great for my eventual application wish to extend the range of my wifi to the outer edge of the garage adding directional antenna to point to Omega located in vehicle on the street. By adding the external antenna the additional Omega buried in the vehicle could have external antenna located somewhere on the outside area of the vehicle. Rudy take a look at 8- 14 dB panel antennas as these should easily do that for you. Just consider the radiation pattern, cabling and shielded connector(s) that will work and pick an antenna design that fits those areas. No need to radiate 360 degrees when your target is across the yard, etc. Exactly the focus could be on a narrow pattern but not so narrow requiring exact pinpoint parking of the vehicle when it has returned from days honey-do-list. @Ken-Conrad Yeah, that might be the reason. The external antenna we had the factory test were some cheap antenna they found off Taobao, so they probably weren't high gain or even impedance matched. @Boken-Lin Ok, I'll do some hardware experiments and see what I can get working. Would you happen to know the default RF power setting of the Onion? Is it the maximum allowed per the country setting? In the US I believe that would be 20mW. @Ken-Conrad The power setting on the Omega is 16-18dBm. Wait! Not sure if a directional antenna can be used in my application. As you recall the idea was to place one Omega just inside the garage picking up the existing wifi signal and extending it to the vehicle in the street. Where there would be the final link in the chain, another Omega. The idea behind using directional antenna was to narrow the area of the wifi signal thereby providing a stronger signal. A by product of using the directional antenna would also narrow the visibility from prying eyes as to the presence of the wifi signal. Not a major concern but nice added bonus. But if I add a directional antenna to the "garage edge" Omega won't I lose the access point connection between my router and the same Omega beings it is now a directional rather then a omni antenna? Unfortunately it is on the outer edge of the wifi signal. Wondering what happens if you add directional antenna to the board will my router no longer be able to talk to the Omega. Meaning the addition of the directional antenna cancels the AP? @Rudy-Trujillo You question is a bit vague. I suspect you are concerned that using an Onion with a directional antenna will mean the Onion can no longer connect with a router which is located outside of the broadcast envelope of the directional antenna. This may be the case, as a lot of things can affect the effective signal range of wifi... the type of wall(s) in the signal path, whether the channel is clear or crowded by neighbors' equipment etc. Maybe you can get by with adding a better antenna to your router. Possibly no one has used a Onion yet with an external antenna. There are many examples of other routers doing what you want to do - I use TP-Link portable routers refitted with directional antennas as repeaters to control various Wifi cameras 300 - 500ft away. I see no software or hardware reason why the Onions can't do the same. Guys are doing asynchronous Wifi video up to a km away with Raspberry Pis. It works, even in HD video. I am waiting for ordered connectors and other antenna parts to range test some Onions. Standby buddy. Worse case, you might need a second Onion with another directional antenna pointed at the router. Otherwise, find a repeater that supports two external antennas. I'm looking to enclose my onion in a metal enclosure, so I'll need at attach an external antenna. What is the manufacturer part number of the connector I'll have to solder on? I hate to nitpick, guys, but the board is called the Omega! Kind of noticed that loose naming usage on here but didn't want to be the on to nitpick Onion the bringer of Omega, all hail. @Lazar-Demin Your web site product photos of the boards do say "Onion". Not a nitpick, just got it. My apology, these boards are Omegas and you are Onion Corporation.